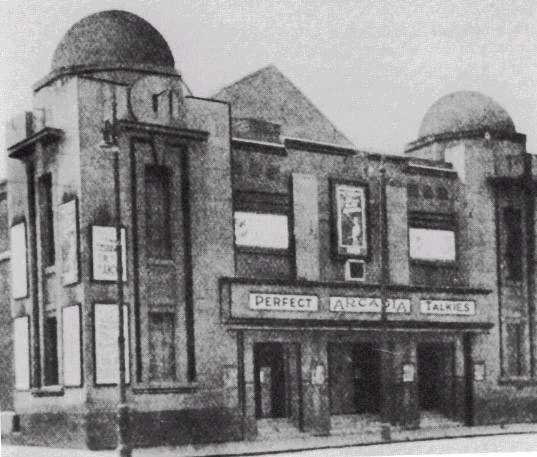 This cinema opened on hogmanay 1930 by cinema giants ABC, it was sold to Harry Winocour in 1939 who sold it to George Green Ltd in Nov.1954 before it closed as a picture hall on 2 Apr 1962. It became a bingo hall before finally being demolished in 1971. London Road at Arcadia Street junction where the Arcadia Picture Hall used to be. London Road photograph taken from Abercromby Street looking over to the Arcadia Street junction, right of the flats. Templeton Business Centre is the building in the background. 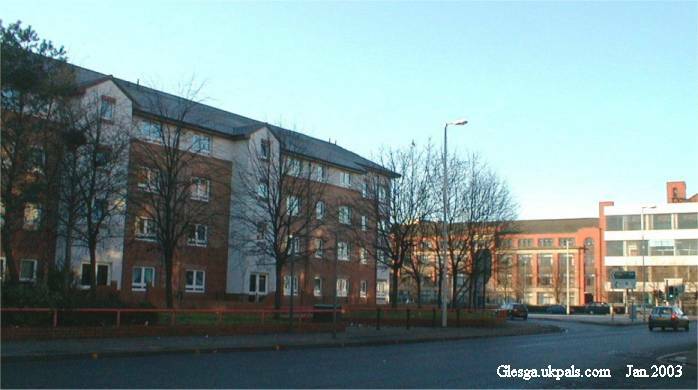 "I lived in Arcadia street during 1946 - 1958, is there not anyone out there who remembers the Arcadia picture hoose on a Saturday morning, playing at Glasgow Green which was at the bottom of the street and it was the only place to go during the summer holidays after you went for your free dinner at the school then you had a picnic to take with you. And of course my old school ' St. Mary's'. What about all of us who lived up the tenements that got pulled down and we either were shipped out to Easterhouse and Castlemilk.... "
Born: Silvergrove Street, Age: 61-70. "Webmaister the photo of the old Arcadia Street picture hall brought back many fond memories of going to the Saturday matinees with my great pal Arthur Park (Narker) to see the likes of Gene Autrey and Roy Rogers and our introduction to horror with Boris Karloff and the creepy wee Peter Lorre (remember him with the dreepy eyelids) We used to take in a carton of wulks to throw down onto people from the balcony when we got bored, or fire peashooters sideways at people's heids so that they thought it was people behind them that were throwing things. Ah yes, the rerr fun we had when we had no sense of responsibility to our fellow man. (My aunty worked in Anderson's Mill in Brook Street I think and used to get me these smashing hollow wooden things for yarn that made great peashooters. This was before the advanced technology of the infamous tottie gun or rubber dober became available). But I digress. After the matinee finished there was a mad rush down the steps into the blinding daylight and along to a bakers shop for tuppence worth of broken cakes before he shut for the weekend. This rush is not to be confused with the one from the open air swimming baths down on the Glasgow Green in the summer. That was purely to try and get warm again! I think the last picture I remember from the Arcadia was 'Floodtide',where Gordon Jackson made a live appearance and signed autographs and if my memory serves me right his gorgeous co star was Rona Anderson. Now THAT'S a long time ago. Oh by the way, your website is terrific." The Arcadia was where I went a lot as I stayed beside it, it was called 'the ranch' as it showed a lot of cowboy pictures. It was in London Rd, and it was 6d to get in. What I enjoyed about the pictures in those days was you had the wee picture, then trailers for what would be next week then the big picture, so you spent hours there. Sometimes in the the Arcadia on Saturday morning they had a contest where kids got up and sang, danced etc. At the interval the ice cream girl came with a wee tray and straps round her back to sell to you, she stood at the bottom near stage, usherettes all had wee hats on head, men I'm sure had wine colour uniform and hat on head.